Greetings, We are with our friends from Charleston, David and Brenda Waldron. We did a road trip last year with them to the parks in Utah. This time we are covering some of the same area but our focus is on the Native American parks and sacred areas. 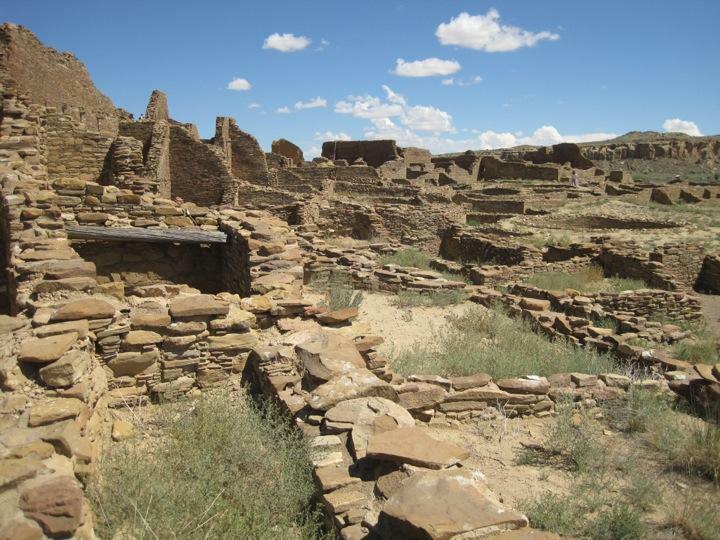 Our first stop was Chaco Canyon, about four hours from Santa Fe. It is in the middle of nowhere. But, one thousand years ago, when it was at its peak, it was the center of the West. People came here from hundreds of miles away for trade, ceremonies and celebrations. Archeaologists are not completely sure what all went on here because the site was looted, making it difficult to understand why these giant buildings were constructed. Wood for support beams and flooring came from forests fifty miles away. There were no beasts of burden at this time, so it was carried in. The stone walls were perfectly aligned and the windows are true. The buildings were four and five stories tall and had hundreds of rooms. Kivas, the design inspired by early pit houses, were large enough to hold hundreds of people. Their importance to ceremonial life is still true today for most Southwest native peoples. The engineering skills to build this site are comparable to what was happening in Europe at the time. Then, suddenly, the population moved on. War? Drought? Depletion of local resources? No one knows why they left but most believe that they were the ancestors to the area Puebloean people, the Hopi, Zuni, Taos, etc., and they relocated to NM and AZ. Their descendents return to this site, walking among the ruins that were once home to their ancestors.